The rise and fall of Albrecht Wenzel von Wallenstein (1583-1634) is one of the most dramatic stories of seventeenth-century German history. The tragic aspects of this extraordinary soldier and warlord’s life prompted Friedrich von Schiller to write a trilogy of plays between 1797 and 1799 (Wallenstein – also known as Wallensteins Lager, Die Piccolimini and Wallensteins Tod). Des Mädchens Klage is a poem taken from the second of these plays, sung by Wallenstein’s daughter Thekla. Schubert’s different settings of this famous lyric are to be heard in Volumes 31, 7 (the second version and the best-known song) and 32 of the Schubert Edition. Two further settings of the poem Thekla: eine Geisterstimme (purporting to be a report on Wallenstein’s afterlife when both father and daughter are in heaven) can be heard on Volumes 1 (D73), 9 and 11 (D595). This is not the place for an extended account of Wallenstein’s long and complicated career which had as its background the Thirty Years’ War and the rivalry of the German states with the Holy Roman Empire ruled by the Hapsburg dynasty in Vienna. For the first time since the Middle Ages, Wallenstein’s efforts made the military right of the Empire something to be reckoned with; but when he became too powerful in his own right he was assassinated at the command of his former masters. Wallenstein was a mercenary and an operator, but Schiller’s plays did much to ennoble his reputation. His betrayal at the hands of the Emperor in Vienna was considered a perfidious disgrace, and many a noble Styrian (then, as now, not over-enamoured of the capital and its rulers) would have seen him as a hero. Rather than put words into the mouth of such a great character, Leitner contents himself with allowing us to glimpse something of the Wallenstein legend through the memories of an old soldier in his cups. Mention of Lützen in the second verse implies that this famous battle of 16 November 1632 was already a distant memory; Wallenstein himself was to survive only a further two years. The brag about the dying Swedish soldier in the fourth verse refers obliquely to the fact that the great Swedish king Gustavus Adolphus was also killed on that day in Lützen, something any German-speaking schoolchild knew at the time. On that occasion the Swedish troops prevailed over Wallenstein’s forces, but this was but one battle lost in a continuing war. For Wallenstein himself Lützen marked the beginning of the end; he had grown so mighty and self-sufficient that the Emperor in Vienna regarded him as a dangerous traitor. Only his stout-hearted men loved him to the end (they are the real heroes of the first of the Schiller plays) and we can hear this in Leitner’s poem which gives voice to one of that intrepid band, a footsoldier (‘Lanzknecht’ derives from ‘Landsknecht’ and has nothing to with a lancer) now out of work and living on his memories. This drinking-song is the last and possibly the best of many by Schubert in a similar vein. The only piece from Schubert’s Graz period which it resembles is the Altschottische Ballade which has a similarly dour and economical musical style and a similarly gruesome storyline. If the song that closes Volume 35 of the Schubert Edition is anything to go by (Lied eines Kriegers, written for the New Year celebrations of 1824/25) such hearty ditties were popular at all-male gatherings which broke out into song as part of the jollifications. This one is not conducive to choral performance (the exploits of a warrior are narrated in the first person) but it would have gone down well as a solo at a bingeing session when the taking of drink was typically linked to death and/or acts of heroism. 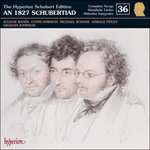 Well aware that he was dealing with a seventeenth-century character, Schubert adopts the archaic style which he employs when he wishes to evoke an earlier century. The sturdy music in a rollicking rhythm, and veering between G minor and B flat major ‘in a reckless way’ as Capell puts it, suggests the modes without actually being modal. (The soldier’s old, battle-scarred helmet is certainly not à la mode.) Much of the music is scarcely harmonised with both hands of the piano on the same notes – and often the vocal line. That the music does not sound at all thin at this point is a sign of Schubert’s ability to imply harmonies without actually writing them, something which a composer like Ravel was to develop to a degree of genius. This portrait of an off-duty soldier has much in common with Schubert’s many evocations of fishermen, hunters and other working types. The idea of viewing an episode of history through the eyes of the ‘little people’, small in importance but large of heart, goes back to Shakespeare, something that was quickly appreciated by German-speaking poets of Goethe’s generation. 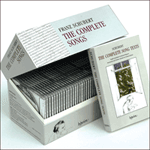 As a result, many of Schubert’s finest songs are sung by similarly homespun protagonists. The 6/8 Bewegung and the unisons between the hands in the accompaniment recalls another determined Schubertian character from earlier in 1827, the surly hunter of Jägers Liebeslied. Einstein finds the music ‘nothing like powerful enough’, but Schubert, not a man in love with violence, has fashioned music for an old soldier who possibly did not play as big a part on the battlefield as he now boasts – a sort of Germanic Falstaff. In the midst of all the descriptions of bloodshed there is a type of Don Quixote-like geniality. Nu! trust’ ihn Gott! Schenkt ein, schenkt ein. Which pleases the lusty drinker. And at night as a pillow. I almost sank to the ground. I would never have drunk another drop. Well, God comfort him! Pour, pour! And I shall often relish it.